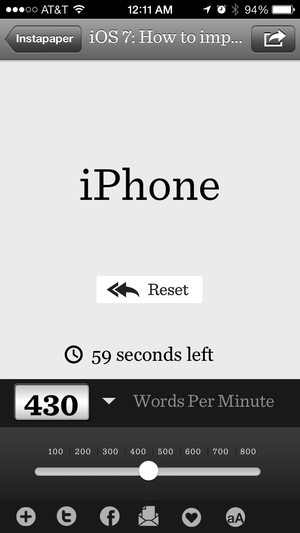 ReadQuick offers a words-per-minute rate between 50 and 800. Move over Instapaper, Pocket, and Readability—some new read-it-later iOS apps have arrived on the scene that not only help you read online content later, they also help you read it faster. The $5 ReadQuick by Action Now and Lickability’s $3 Velocity do this by helping you break a habit called subvocalization, which is just a fancy linguistic term for silently sounding out words as you read. According to Velocity’s short tutorial, the average person reads at a speed of about 200 WPM (words per minute), which is, uncoincidentally, about how fast humans speak. Supposedly, it’s the act of subvocalization that holds back your brain’s natural ability to process written text at a much faster rate. Velocity's words-per-minute rate ranges from 100 to 1000. Both Velocity and ReadQuick take a similar approach to solving this problem by presenting written text one word at a time on your iPhone, iPad, or iPod touch. If you’re like me, you’re probably thinking that this sounds a little odd. However, it only took me a few minutes to get accustomed to words flying across the screen before I was sold on the concept. 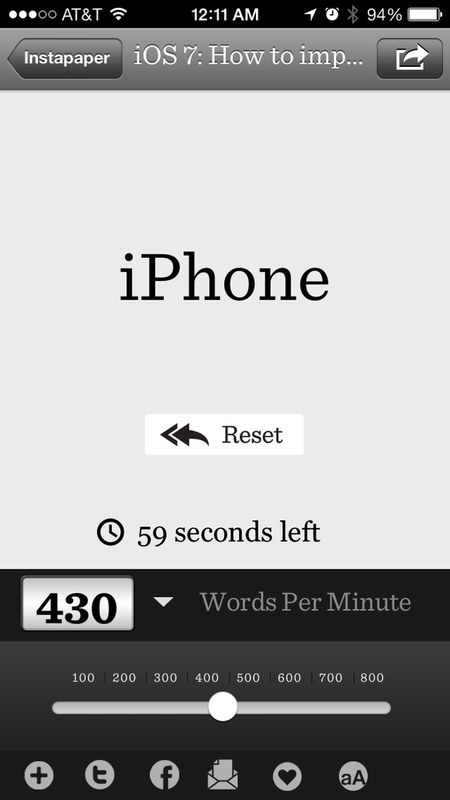 Both apps start out at around 250 WPM and, as the theory goes, by gradually increasing this speed, you eventually outpace your inner voice, which then allows your brain to begin processing text at greater and greater speeds. Like other read-it-later apps, both Velocity and ReadQuick take Web pages you provide and strip out all the extraneous content. Both ReadQuick and Velocity provide a scaled-down Web browser that you can use to browse and save pages. Velocity also recognizes URLs that you have copied from other apps, such as Safari or Mail. So, when switching back to the app, Velocity will automatically offer to either display the page immediately or save it for later. I especially like this feature since it saves me a couple of steps while I’m browsing content in other apps. If you’re a regular reader of several popular blogs, then ReadQuick lets you browse those partners’ sites directly. However, where both apps shine is in their ability to connect to the popular read-it-later services Instapaper and Pocket. (For some reason, neither app offers a connection to Readability, my preferred read-it-later service.) Instapaper users should be aware that Velocity requires that you have a paid Instapaper subscription while ReadQuick works just fine without. Velocity's content browser is clean and simple. Velocity’s content browser is pleasantly clear and easy to use. It allows you to browse articles in your Instapaper or Pocket queues or access articles that you’ve saved directly in the app. ReadQuick’s interface provides those options, and more, without adding any needless complexity. I think ReadQuick’s historical progress statistics is a feature many would appreciate, and I especially like how ReadQuick displays the estimated completion time of each article at the selected rate. As far as reading content goes, both apps are nearly identical in this regard. After selecting an article from your library, individual words start flying across the screen at the rate you’ve selected. Velocity’s speed options range from 100 to 1000 WPM in increments of 20 while ReadQuick’s scale goes from 50 to 800 in increments of 5 WPM, which I found slightly difficult to control precisely. Tapping on the screen lets you start/stop playback. Both ReadQuick and Velocity display black text on a white background by default but provide an optional white-on-black “night mode.” Velocity also provides a sepia tone option. 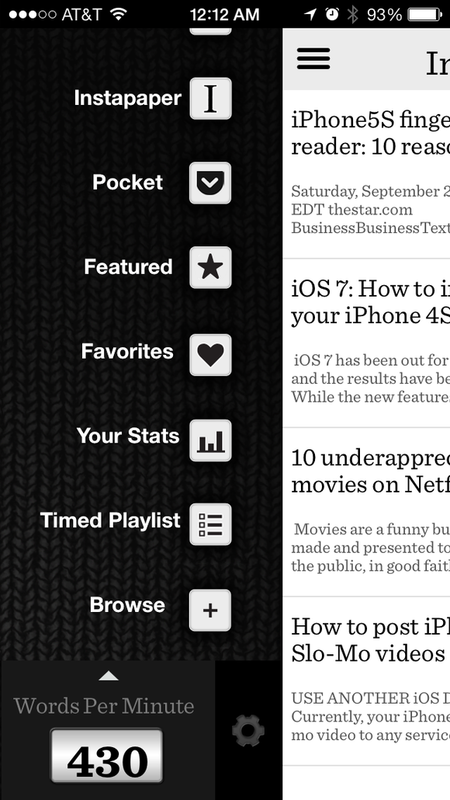 ReadQuick's content browser has more features for handling your reading material. After having used both these apps for only a short time, I’m not sure if can say my general reading speed has improved dramatically, however, I find that I can now catch up on my reading list very quickly when using either app. In all honesty, though, I had an ulterior motive for my interest in these apps. I like to read while using the elliptical machine at the gym, and reading standard-formatted content on my iPhone can be challenging in that environment. I was on the lookout for a better reading app, and I’ve found that reading at the gym is now much easier in this format, regardless of reading speed. At $5, ReadQuick is a tad more expensive than Velocity. However for the additional $2, you get a few extra features in a universal app that’s optimized for both the iPhone 5 and iPad screen sizes. 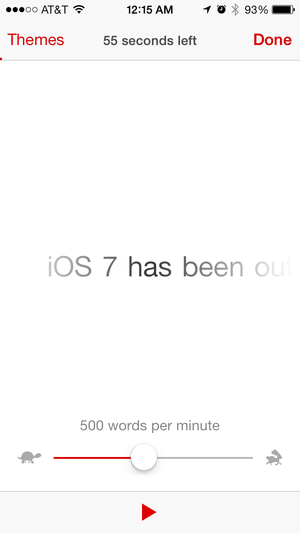 (It also works fine on the smaller screen size of older iOS devices.) That said, while I normally avoid running iPhone-specific apps on my iPad, I think Velocity looks just fine at 2x resolution on the iPad’s screen. No matter if you’re looking for a tool to help increase your reading speed, help you plow through large amounts of content, or if you’re just looking for an alternative way to read on your device, either ReadQuick or Velocity will work just fine. 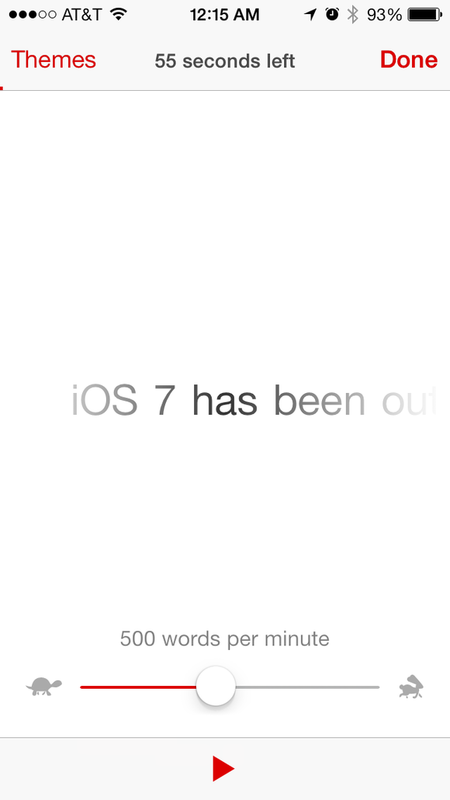 People who read more extensively on both their iPhones and iPads, in addition to Instapaper users who do not pay for a monthly subscription, should opt for ReadQuick. Less demanding readers will likely be satisfied with the simpler, and less expensive, Velocity. People who read more extensively on both iPhones and iPads, in addition to Instapaper users who do not pay for a monthly subscription, should opt for ReadQuick. 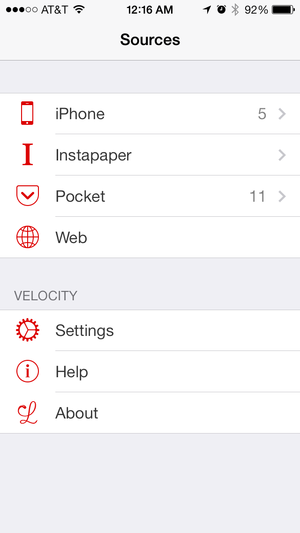 Velocity doesn't have as many features as other similar apps, but it's still satisfies as a reading app.